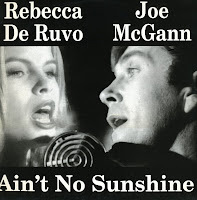 It's not the first time that Joe McGann and MTV hottie Rebecca de Ruvo appear in this blog, as I've owned the 12" single of 'Ain't no sunshine' for 17 years now. I wrote about that one way back in December 2009. When you compare the sleeve of that 12" single with the sleeve of this 7" single, I'm pretty sure you'll agree that this one looks way better. Why the record company decided to go with the ugly version for the 12" single remains a mystery. The song remains the same: a nice but unhistoric version of a classic song. 'Ain't no sunshine' was originally a hit for Bill Withers in 1971. It was re-recorded by Joe McGann and MTV hot babe Rebecca de Ruvo with a studio group called Bi Virtue. This 12" single was released in 1992. This is one of those releases that sinks without a trace, fails to chart anywhere, and ends up in the sales bin all over Europe. I didn't know this version, but was curious enough about Rebecca de Ruvo's singing qualities to try it out. Hearing this now, it really sounds like an early Nineties production.